In embroidery, for instance, we have standard embroidery, appliqué, 3D, while in print there is screen print, direct to garment and, the one we will be talking about here, transfer print. Transfer printing is nothing new. It has been around for many years in one form or another. The early versions of this process were limited in what they could offer and, to be honest, the finish was nowhere near the standard of today’s offerings. It was also restrictive in the colour of the substrate (T shirt) it could print onto limiting it to white or a very pale colour. Thankfully things have changed a lot over the past few years and transfer printing is back with a vengeance. Firstly, we are no longer limited to printing onto a restricted colour range. With printers now using white ink we can just as easily print onto a black T shirt as a white one. This has been a major advance in this style of decoration and allows it to sit more comfortably beside other forms of printing. The process is much easier these days as well. The development of the software means that it is virtually no different to printing a photograph or a document. All machines used in this process come with software specially developed for the machine which breaks down the image into its constituent parts very similar to how screen-print software separates the colours. If using white ink, you simply click the appropriate section in the software and it will then work out that it needs to apply a white base. Unlike other forms of printing though it adds this last as it needs to sit on the top of the print so that it is the first thing transferred onto the shirt. It is important to only use the software (sometimes called a RIP) that comes with the machine. This has been calibrated to work with the firmware in the machines and so will produce high quality prints. In the past it was also the case that you needed to use specific paper but that has, thankfully, changed. You can now use just about any of the well-known transfer papers currently available on the market although it is always a good idea to check with the machine supplier before you start. Unfortunately, there are papers out there that are, let’s say, not up to the quality of the best-known ones and, with machines costing between £1,500 and £2,000 for an A4 model, the last thing you want to do is invalidate a warranty by using sub-standard consumables. Another of the improvements we have seen is in the finish, or handle, of the shirt. It used to be that a transfer print could be easily spotted just by picking it up with the finish being very stiff. Thankfully this is no longer the case with transfer printed garments now feeling similar to direct to garment or screen printed ones. As with other forms of garment decoration though it is always wise to ensure that the care instructions include ironing on the reverse side. 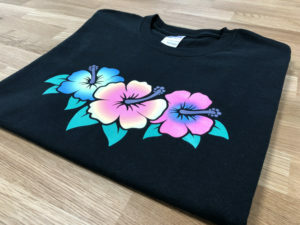 As we can see transfer printing has come a long way and is definitely considered a mainstream method of decorating T shirts and other suitable garments. It has now though gone further than that. With certain machines the process is also available for other substrates such as such as wood, metal, glass and ceramics giving you even greater earning potential. This means that the same design can be easily applied to a range of products thus expanding personalisation and branding. All you need to ensure is that the right amount of heat and pressure can be applied to the product. Machines are available in both A4 and A3 format and need virtually no maintenance making this method of decoration easy and cost effective. 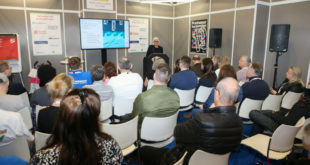 With low investment and high return this method can be a stand-alone business or it can be added to an existing print flow. Whichever it is though, it means that for little cost you can offer your customers another method of decoration.